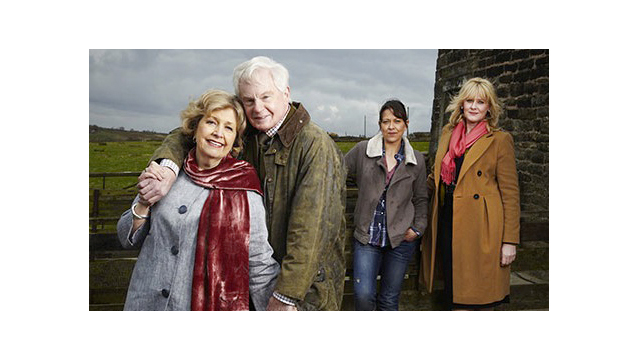 PASADENA, CA; JANUARY 20, 2014 -- BBC Worldwide North America Sales & Distribution and PBS announced today that the critically acclaimed British drama LAST TANGO IN HALIFAX will return for a second season in the U.S., debuting June 29 2014, at 8:00 p.m. ET on PBS. New sitcom VICIOUS, also starring TANGO lead Derek Jacobi, will join the lineup on Sunday, July 6 at 10:30 p.m. ET. Written by Sally Wainwright (“Scott and Bailey,” “Unforgiven,” “At Home With the Braithwaites”) and directed by Euros Lyn (“Black Mirror,” “Sherlock”) and Jill Robertson (Law & Order: UK), LAST TANGO IN HALIFAX tells the story of love struck septuagenarians Alan (Jacobi) and Celia (Anne Reid) who rediscover their love for each other later in life — 60 years, in fact, after they first met. The heart-warming series, which was named one of the “Best TV shows of 2013” by Variety, was the BBC’s highest rating new mid-week drama of 2012, regularly attracting more than seven million viewers with its captivating mix of effervescent humor and moving drama. Made by Red Production Company for the BBC, LAST TANGO IN HALIFAX is produced by Karen Lewis with Nicola Shindler, Sally Wainwright and Matthew Read as the executive producers. The six-part series returns as Alan and Celia continue to negotiate family baggage to plan a life together. Having come so close to losing each other forever thanks to Alan’s near fatal heart attack, he and Celia decide to have a romantic secret wedding as soon as possible. But how will their respective daughters react? The uptight Caroline and rebellious Gillian are discovering they actually quite like each other, however Gillian’s need to own up to her night with Caroline’s ex-husband John could jeopardize the soon-to-be stepsisters’ fledgling friendship. As secrets from the past come tumbling out and family members adjust to changing relationships, can Alan and Celia find the long-awaited happiness they deserve? In addition to Jacobi (The King’s Speech, “The Borgias,” My Week With Marilyn) and Reid (“Upstairs, Downstairs,” “Marchlands”), LAST TANGO IN HALIFAX features Sarah Lancashire (“Five Daughters,” “Wuthering Heights,” “Inspector George Gently”) as Caroline, Nicola Walker (“Inside Men,” “Spooks,” “Being Human”) as Gillian, Tony Gardner (“Fresh Meat,” “My Parents Are Aliens”) as John, Dean Andrews (“Life On Mars,” “Ashes To Ashes,” “Marchlands”) as Robbie, Nina Sosanya (“Silk,” “Five Days,” “Hustle”) as Kate, Ronni Ancona (“Skins,” “Big Impression”) as Judith and Josh Bolt (“Shameless,” Nowhere Boy) as Raff. BBC Worldwide Americas Sales & Distribution is one of five core businesses operating in the U.S. under BBC Worldwide, the commercial arm and wholly-owned subsidiary of the UK public service broadcaster, BBC (British Broadcasting Corporation). BBC Worldwide exists to maximize the value of the BBC’s assets for the benefit of the UK license payer, and invests in programming in return for rights. The Sales & Distribution business negotiates, sells and distributes television programs to networks and secures co-production partners in the region. Red Production Company is one of the UK’s leading independent drama producers. Since 1998 Red has worked with the UK’s leading writers including Russell T Davies, Paul Abbott and Sally Wainwright on productions such as “Queer as Folk” (C4), “Clocking Off” (BBC1), “Bob & Rose” (ITV), “Scott & Bailey” (ITV), “Hit & Miss” (Sky Living) and “Last Tango in Halifax” (BBC1). For more information visit www.redproductioncompany.com, follow us on Twitter, watch us on YouTube or ‘Like’ us on Facebook.